Sometimes, however, one does have to wonder if "they" have any idea about what they are saying. Hugh the Neighbour and I cast a fair net when looking for new beers. Thus, it was with great joy that I opened an envelope from Uncle Dan's showing new and exciting things to drink. 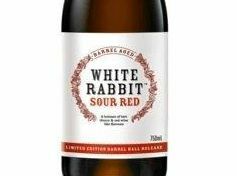 While perusing the glossy pages of gins and wines and ciders and beers, my eye was taken by a new brew from one of my favourite breweries - the White Rabbit Sour Red Ale. Even on paper, this did not look like a beer to be taken lightly. A substantial 750ml and near enough to $24 per bottle and the fact that I had never had a Sour Red before made me think this was not a beer for the faint-hearted. And I was not wrong. It pours a beautifully rich red in the glass, with creamy head and beguiling bouquet, the label promising "a balance of tart cherry and red wine-like flavours". Even, now, six days after HTN sat down to crack the tallie, I am still unsure if I think it is innovative and challenging; or just rubbish and almost undrinkable. Hugh, who has had a lifetime in the legal profession, was more cut and dried than me. "I don't like it at all," he said, "It tastes neither like wine or beer, and while you get the sourness and cherry overtones, it is just not enjoyable." And I can see his point. The words I would usually use to describe the taste don't seem to apply, nor do the traditional terms you would use to describe a wine. White Rabbit claims to offer fermentation with imagination, and they have lived up to that in spades. I don't think I liked it, but it was strangely compelling at the same time - and unfortunately, at nearly $24 a bottle, I was unlikely to have enough to see if it grew on me. As they say on Star Trek, "It's beer, Jim, but not as we know it". If you do try it, I would love to get your thoughts, because I must admit, this one has me stumped.